The United States is the leading consumer of coffee in the world, in fact, Americans drink about 400 million cups of coffee per day. An average coffee cup size is 0.27 L (≈9 ounces), therefore the U.S alone consume about 108 million liters (≈28.5 million gallons) of coffee per day. Coffee is a brewed drink prepared from roasted coffee beans, it grows in a very specific area of the world called ‘the coffee belt‘, roughly between the tropic of cancer and Capricorn. Coffee beans aren’t actually beans, they’re seeds from the coffee cherry, the two main species of coffee are Coffea and C. arabica. Coffee is actually a really healthy beverage, it contains a lot of antioxidants which inhibits the oxidation of other molecules. An average cup of coffee is mostly water (≈95%), the other 5% contains most of the important stuff. 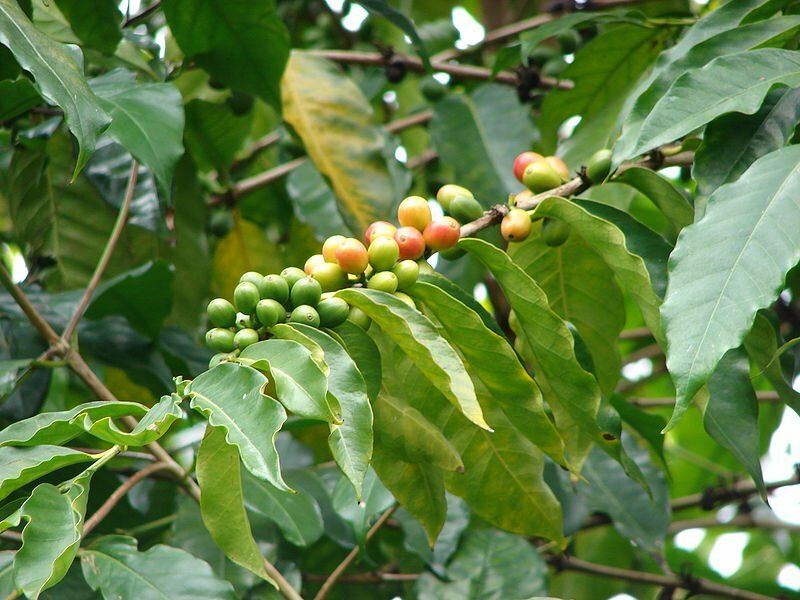 The coffee plant is an easy to care for plant, therefore, you can easily grow a coffee plant at home. –Caffeine which is the world’s most consumed psychoactive drug (a chemical substance that changes brain function) which I am gonna explain in a bit. Caffeine also helps reduce inflammation, it can also be considered as a mild painkiller. Sadly, there is a lethal dose of caffeine which is about 150mg of caffeine per kilogram of your body. –Antioxidants: as I said coffee is loaded with antioxidants these include melanoidins and chlorogenic acids (CGAs) which are believed to be responsible for the weight loss and the anti-inflammatory effects. –Diterpenes: these include cafestol and kahweol which are naturally present in the oil inside coffee. Diterpenes are believed to be good for the liver and linked to the ‘anti-cancer properties’. Note: Other compounds includes Acrylamide, Furan and ‘Ochratoxin A’ which arise during the storage. What Caffeine Does to Your Brain ? When you are awake a neurotransmitter called Adenosine that promotes sleep starts to accumulate.In fact, Adenosine has an inhibitory effect on the brain and it gradually build-up making you feel tired throughout the day. An inverse process happens when you are asleep, Adenosine levels decrease and you become less tired until you wake up. In order for this to happen, each molecule in the brain has a receptor.But you should know that one receptor can be occupied by more than one molecule. 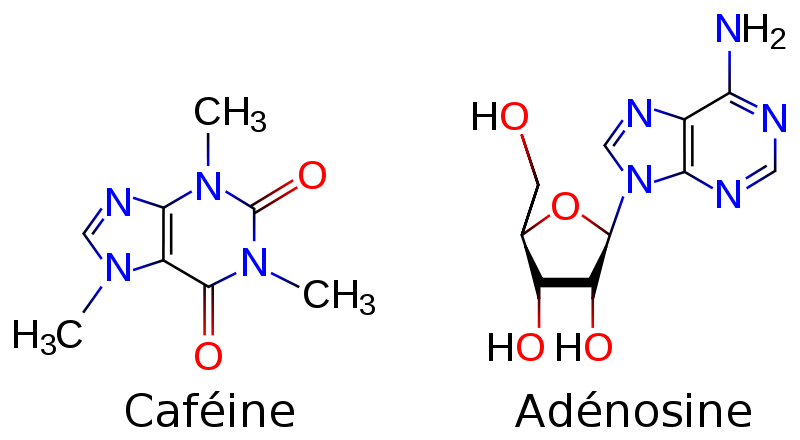 Caffeine molecule has a similar structure to Adenosine, therefore when you drink coffee caffeine enter your bloodstream into your brain vessels and starts competing with Adenosine molecules, a phenomenon called antagonism. The higher the concentration of caffeine, the more likely caffeine will bind to adenosine receptors instead of adenosine itself. And here occur the major difference, caffeine hasn’t the same inhibitory effect. In fact, caffeine is known to promotes central nervous system stimulation, making you feel alert and less tired. Moreover, Caffeine activates noradrenaline neurons and seems to affect the local release of dopamine and inhibits its reabsorption in the synapse thus you feel happier and satisfied for a longer period of time. Cocaine has a similar mechanism, just to a lesser degree. 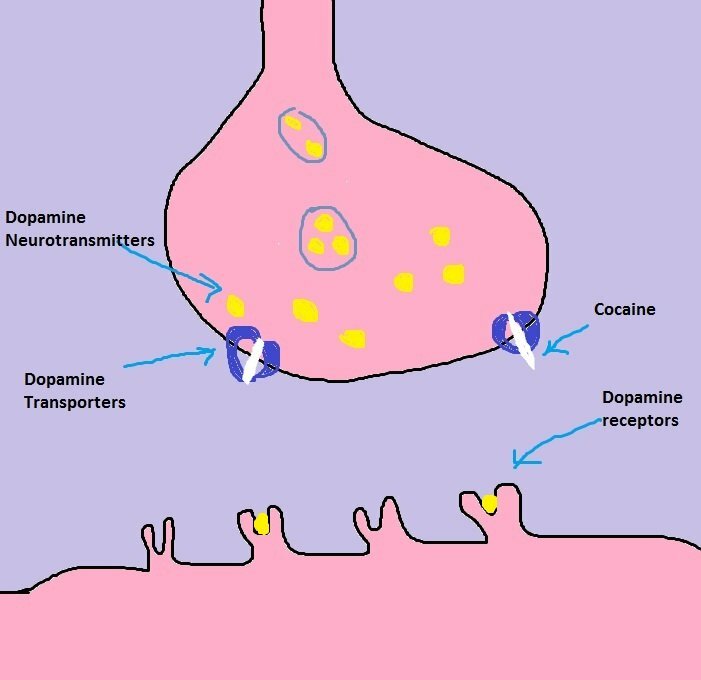 As dopamine increases pleasure centers are stimulated and caffeine addiction begins to occur. But with long-term use of caffeine, changes in the brain start to take action. Brain plasticity is a phenomenon that happens to adopt higher/Lower concentrations of a neurotransmitter in the brain.It can be either an Up-regulation = increased receptors or a Down-regulation = decreased receptors. In this case, the rush of caffeine and adenosine lead to an increase of adenosine receptors. Unfortunately, a more dose of caffeine is required to have the same effect in the future. This is why coffee drinkers begin with one cup/day and end up with 5! Also, a lack of coffee creates a feeling of withdrawal worse than someone who has never consumed coffee. Likely The central nervous system does not seem to develop a great tolerance to the effects of caffeine. Two major studies published July 10 in the journal Annals of Internal Medicine concluded that coffee drinkers have a longer lifespan than average. Besides Many Epidemiological studies have been done, the results were inconsistent but one study showed that drinking 3-5 cups per day at midlife was associated with a decreased risk of dementia/Alzheimer’s disease by about 65% at late-life. The anti-cognitive decline and anti-aging effect of the caffeine are real but More studies are yet to be done. Why some healthy individuals die suddenly? Hypertension and salt intake: What if We’re Wrong all the way?